Having whiter teeth can create the impression that they’re younger and healthier. In many cases, our smile makeovers start with professional teeth whitening to enhance the natural anatomy of otherwise healthy tooth enamel. 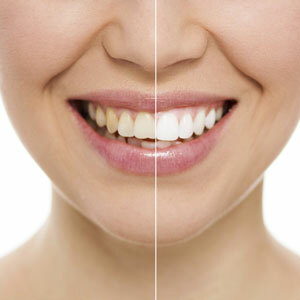 Professional teeth whitening treatments provide better, faster results than over-the-counter products. Not only are teeth whitened, you can also complete this in the comfort of your own home. The professional concentration of ingredients in the treatments we use allows for safe and efficient whitening results. Similar products cannot be sold in stores and must be applied by a dental professional. Save on Home Whitening Kits! If you’d like to brighten your pearly whites from the convenience of home, we offer White Dental Beauty whitening kits for just $350, a savings of $100! * White Dental Beauty features four whitening systems that yield safe and effective whitening results. If you have sensitive teeth one of the formulas is milder and can manage sensitivity. For help choosing the most appropriate bleaching strength for your smile needs, you can discuss the options with one of our dentists. In addition to providing long-lasting results, treatment options are minimally invasive. With White Dental Beauty’s 6% Hydrogen Peroxide whitening gel that’s now available to use at home, teeth can be whitened from as little as 30 minutes a day. The whitening kits include custom-moulded trays that you may use more than once to help keep your teeth stain-free. Before you whiten, you’ll want to make sure you’re up to date on all dental care and your smile is free of both decay and gum disease. New patients will need to have a brief exam to ensure their mouths are healthy enough to whiten before starting the process. Give yourself the gift of whiter, brighter teeth. Schedule a consultation today!